In the Password Protection dialog box, type the password you want into the Enter Password box. If you’ve applied passwords to multiple sections in your notebook, you can lock them all at the same time. Right-click any of the protected (but currently unlocked) section tabs and then choose Password Protect this Section. In the Password Protection task pane, choose Lock All. Right-click the section tab that has the password you want to change, and choose Password Protect this Section. In the Change Password dialog box, type the current password into the Old Password box. Type the new password into the Enter New Password box. Confirm the password by typing it into the Confirm Password box, and then click OK.
Right-click the section tab that has the password you want to remove, and choose Password Protect this Section. In the Remove Password dialog box, type the current password, and then click OK.
Password-protected sections that you’ve unlocked will lock again automatically if you’re not working in them. You can customize the period of time, and you can set other options for the ways that password protection is applied to your protected sections. In the OneNote Options dialog box, choose Advanced. To lock notebook sections after a specified amount of time, select Lock password-protected sections after I have not worked in them for the following amount of time, and then select the amount of time that you want. To lock notebook sections immediately after you're done working in them, select Lock password-protected sections as soon as I navigate away from them. To make notes in password-protected sections temporarily available to other programs, select Enable add-on programs to access password-protected sections when they are unlocked. Click OK, to apply your preferences. Passwords can be applied only to notebook sections, not to entire notebooks. Passwords are case-sensitive. Make sure that the Caps Lock key is off before you create or enter a password. OneNote uses encryption to secure password-protected sections. If you forget your password, no one will be able to unlock your notes for you (not even Microsoft Technical Support). So take care when assigning passwords to your notebook sections and when changing them. Password-protected sections aren’t included in notebook searches. To include a protected section in a search, you’ll have to unlock the section first. Note tags used on any of the pages within a protected section aren’t included in a note tag summary unless the protected section is unlocked. Why use passwords in OneNote? Personal privacy Your notebook may include a dedicated section or folder that contains personal data, such as your home address, telephone numbers, Social Security number, bank and credit card account numbers, Web site login credentials, and similar information. In this age of rising identity theft, leaving this type of information unprotected is risky business. OneNote encrypts protected sections to help keep your personal information secure. Flexible security If you use OneNote to document your life at school, at work, and at home, you're likely to set up separate sections for each. Depending on how you want to share such information with others, you can assign different passwords to different sections. Secured mobility Unlike a computer password, which controls access to your computer, but does not protect the individual files stored on it, OneNote password protection remains with your notebook file. It helps secure sections of your notebook even if your notebook file is copied to another computer or a file server, or if your laptop or Tablet PC is lost or stolen. To help prevent unauthorized access to your notes, you can apply a password to specific sections of your notebook. Click the tab of the section you want the password to apply to. On the File menu, click Password Protect This Section. In the Password Protection task pane, click Set Password. In the Password Protection dialog box, type the password you want in the Enter password box. Confirm the password by typing it in the Confirm password box, and then click OK. When you work in a password-protected section in your notebook, it remains unlocked for a period of time that you can specify. 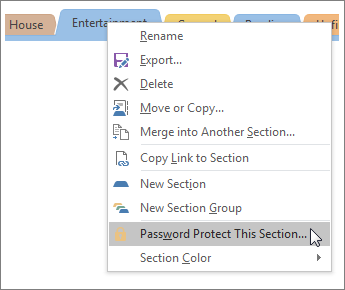 To increase security, you can set the option to lock protected sections as soon as you navigate away from them or when you close OneNote. When a protected section is locked, the correct password is required to view and edit the section. You can easily change or remove the password for sections in your notebook. Access to sections with passwords is restricted after a period of inactivity that you can specify, or after you exit OneNote. Password-protected sections are not included in notebook searches. To include a protected section in a notebook search, you must unlock the section before you begin to search your notes. Note flags used on the pages within a protected section are not included in the note flag summary unless the sections are first unlocked. Password-protected sections cannot be accessed by others during a live sharing session, even if the section is unlocked during the session. To include a protected section in a live sharing session, you must first remove the section's password protection and then start or join the live sharing session. Audio and video recordings are stored as separate files in your notebook and you cannot apply passwords to them. If a password for any section in your notebook has been compromised, or if you want to modify all of your passwords periodically for extra security, you can easily change the existing password for any section in your notebook. Click the tab of the section whose password you want to change. In the Password Protection task pane, click Change Password. Note: If this option is unavailable, no password is currently applied to the selected section. In the Change Password dialog box, type the current password in the Old Password box. Type the new password that you want in the Enter New Password box. Click the tab of the section whose password you want to remove. In the Password Protection task pane, click Remove Password. You can lock all password-protected sections in your notebook simultaneously. In the Password Protection task pane, click Lock All. Tip: To quickly lock all password-protected sections in your notebook, press CTRL+ALT+L. When you unlock password-protected sections in your notebook, OneNote keeps these sections available for a period of time before locking them again. You can specify that period of time, and you can set custom options for password protection. In the Category list, click Passwords. To lock notebook sections after a specified amount of time, select the Lock password-protected sections after I have not worked in them for the following amount of time check box, and then, in the list, click the amount of time that you want. To lock notebook sections immediately after you're done working in them, select the Lock password-protected sections as soon as I navigate away from them check box. To make notes in password-protected sections temporarily available to other applications, select the Enable add-on applications to access password-protected sections when they are unlocked check box.